The path passes by Kapaa Beach Park on its way south. 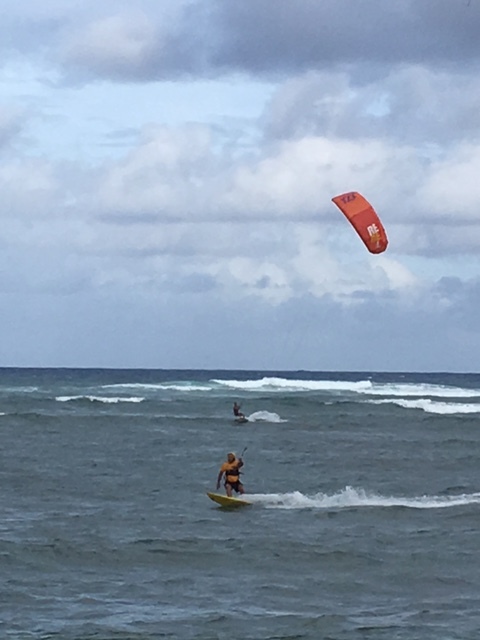 Lots of windsurfers were out the day of our walk. The Beach Park is NOT a safe swimming beach, but is a great place to relax, sunbathe, and enjoy the views. 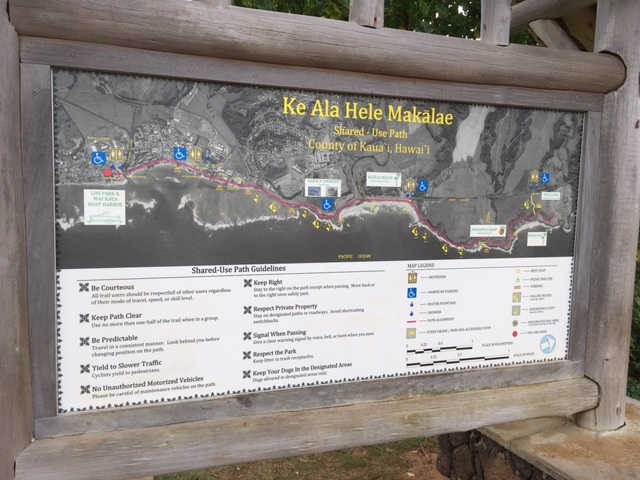 The Ke Ala Hele Makalae, the “path that goes by the coast,” runs for eight miles along Kauai’s east side, from just south of Lydgate Park all the way up through the eastside’s “Coconut Coast” past Donkey Beach in the north (and it’s currently being extended all the way north to Anahola Beach Park). 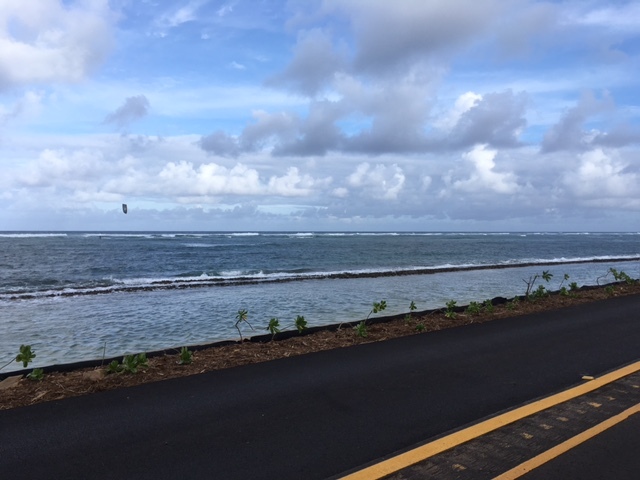 The wide and mostly flat path is shared daily by walkers, runners and bike riders, and provides beautiful shoreline views almost the entire length. While the stretch from Kealia Beach to the old Pineapple Dump is our favorite, Brett and I also enjoy the walk along the Kapaa shoreline. There are frequent signs along the beach path letting users know where they are as well as guidelines for using the path. A couple of weeks ago, while the girls went for a run heading north, Brett and I set off in the other direction on the path, a flat 3/4-mile stretch that runs from the Kapaa Community Center south to Keaka Road, where the path turns to go through town for a while before coming back to the shore. The day was quite breezy, and we could see storm clouds out to sea as well as coming over the mountains from the other side, but we felt we had enough time to get to Keaka Road and back before any rain arrived. We packed a few beach towels just in case we got our timing wrong. And get it wrong we did! A squall came sailing in from the northeast and drenched Brett & me just before we reached our car. The girls were also on their way back to the car and got soaked as well, but we all toweled off and headed for home, admitting that we were actually thankful for the rain because it had cooled us off. 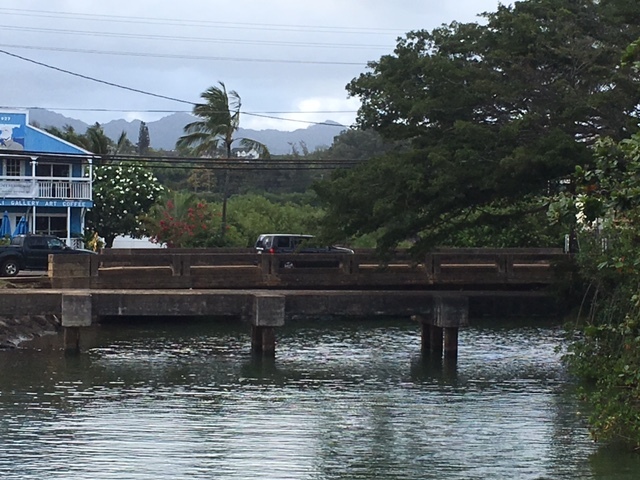 The path crosses over the Mo’ikeha Canal as it heads out to sea. The low bridge in front of the highway used to carry sugar cane and pineapple trains. 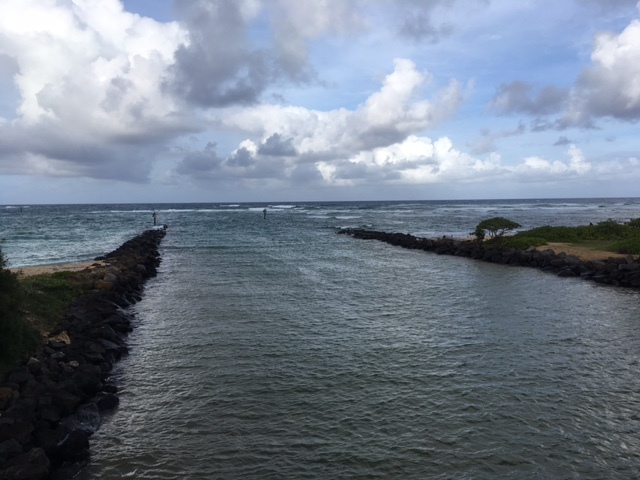 The Waika’ea Canal, further down the path, is the main Kapaa boat channel. 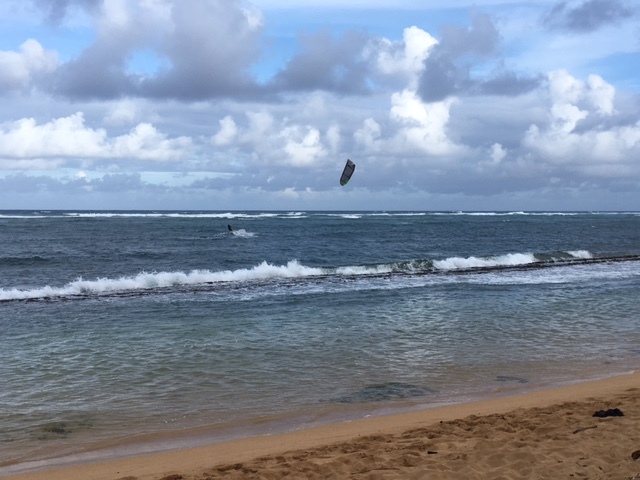 A windsurfer speeds by at Fuji (Baby) Beach, located just south of Kapaa Beach Park. Locals often gather here after work to relax. 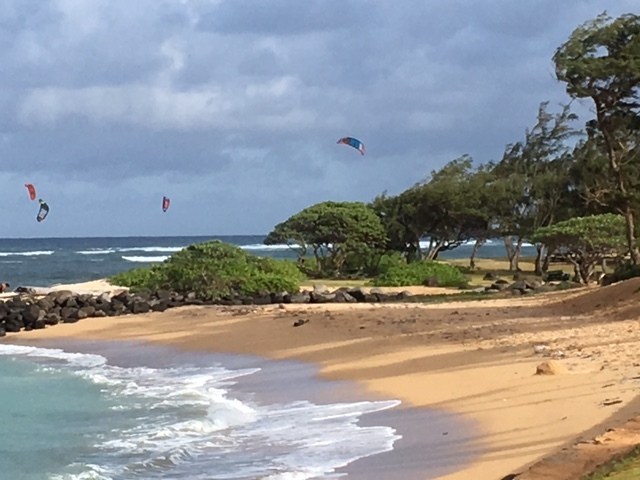 The “wall” at Baby Beach is a naturally occurring sandstone formation which creates a calm, safe swimming spot in front for keiki (kids), making it a popular beach with local families. Just after the path turns at Baby Beach, it merges onto Moanakai Road with its one-way car traffic. The path is off to the side and well-marked. 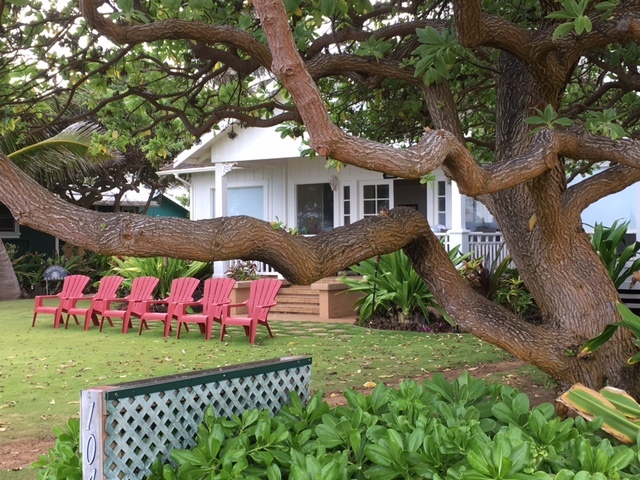 Sunrise Cottage, a vacation rental located across the road from Baby Beach, offers front row seats for each day’s sunrise. The Hotel Coral Reef always makes me want to walk over and book a room! Although it’s a great walk any time of day, sunrises are a speciality on the eastside coastal path. I’m not an early riser, but an early-morning walk along the Kapaa stretch to experience one of Kauai’s spectacular sunrises is high on my bucket list! I’d love to sit in one of those chairs and watch the sunrise at Sunrise Cottage! I feel the same way every time I walk past Sunrise Cottage! 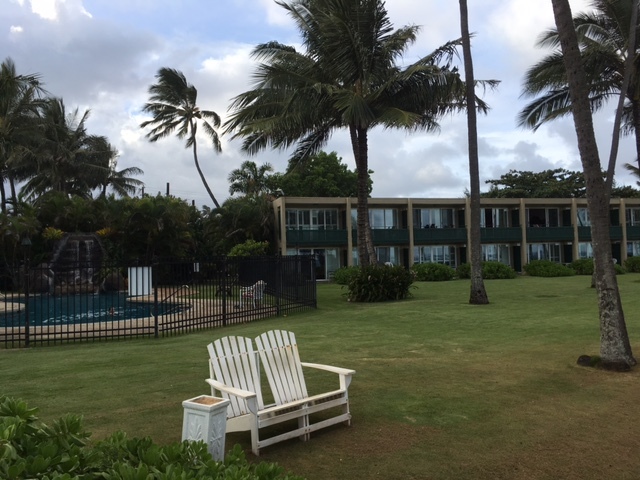 The Coral Reef Hotel makes me feel the same way – its rooms are lovely and the views from the ocean front rooms are gorgeous.